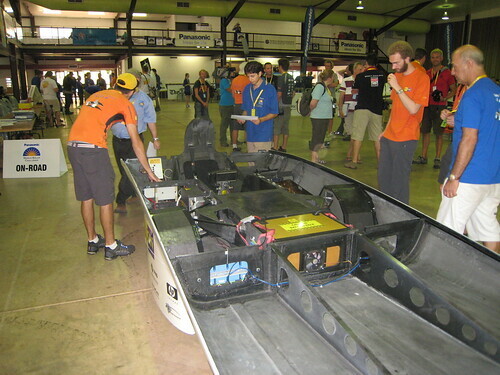 After several weeks of testing, Nuna has passed its major test to participate in this year's World Solar Challenge. Having received no other comments other than headlights that could have been larger, this year's scruitineering was passed without dramas. Over 2,000 kilometers have passed beneath Nuna's tires, and the time has come for qualifying to determine our race position for the race's start on Sunday morning. Our first few practice laps were run on Wednesday afternoon. It quickly became apparently Nuna4 was a little more "frisky" than previous Nunas, completeing the trial runs a full 30 seconds faster than Nuna3 and having plently left to spare. Our Michelin slicks bore the punishiment without a complaint, but were reduced to canvas after only 7 laps. It will prove to be a very exciting day tomorrow, as we hope to better our previous qualifying placements, and will face the race's start on Sunday. Everything is racing race steady state, having gathered all our support vehicles (15 in total with semi-truck), along with our hearty and familiar support crew, the Nuna3 team accompanied by Wubbo Ockels. We face the race with full confidence and a fantastic team spirit. We fully expect this Nuna to live up to its expectations and be a seriously fast racing machine.